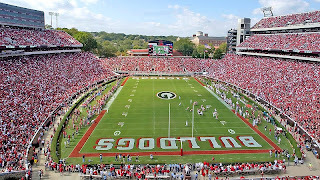 The last time (above) ESPN College Gameday came to Athens was the 1998 Tennessee game. UGA fans were riding high coming off a road win over Top 10 LSU in Baton Rouge. We had a freshman QB who had just set the bayou on fire under the lights, and Champ Bailey was totally unstoppable on both sides of the ball. Tennessee was playing the game without Peyton Manning, who was the Bulldog Anti-Christ for 4 years, and Jamal Lewis was out of the game with an injury suffered at Auburn the week before. Gameday opened with WCW Champion Bill Goldberg looking into the camera and saying something like, "Tennessee...You're Next." Things looked great...well...until the game started and Tennessee physically beat the ever living hell out of Georgia. The 22-3 score doesn't remotely begin to reveal the physical difference between the two teams. Today's underclassmen students were 8-9 years old on that painful day. We enter the game tomorrow with superior or equal talent at every position except one (Left Tackle). Just as importantly, we have a world class coach who has instilled a work ethic that breeds success. Big wins aren't shocking anymore to Georgia fans. On the other side of the field is Bama. This is NOT the Alabama program of the 60s, 70s and 80s. Not yet anyway. This is an Alabama team that lost to Louisiana-Monroe last year. This group of players has yet to face an elite SEC opponent in a game with this much build-up and come out the other side a winner. Dealing with that spotlight isn't easy. All the intangibles favor Georgia. Most of the personnel match-ups favors Georgia. And it's a home game. If Georgia protects the ball like it has all season and covers kicks at least as well as they did versus Arizona State, we're going to win this thing by 7 points or more. In 2008, Georgia doesn't hope to win. Georgia expects to win. It's going to be a war, and Bama isn't going to roll over for us. But, I can't wait for Saturday. Down goes Frazier...I mean USC. Wow. I wonder how many people outside of Corvallis saw that coming? Wait....if USC lost, does this mean we have to play the rest of the seaon now? Don't worry no team in the SEC is the USC. The big over rated Turd in the punch bowl. WE fo real doe! Trojans..Falling..Falling…Oh look at the Pac-10 Falling from the sky!!! Look at the Pac-10 Falling from the sky!!! Do you know whats gonna happen …in Norman …and Athens …and Columbia where all those REAL teams have a new lease on life?!!!! MAN is there gonna be some property destroyed tonight?!!! this also isn't the Alabama team of last year that lost to ulm. rammer jammer. I'd love to hand some top votes over to UGA right now, but as they say, and USC now knows, better wait to count 'dem chickens. Karma can be a b%#ch. I'm just curious though. What will all the talking heads on the teevee know what to do now? Baxtor, not to far from me. How are you so far south and such a big Dawgs fan? Hey Brandon....Georgia raised, class of '98. Just wound up in MS for law school and stuck around. baxter.. I've had too much too drink, as of 12:50 central time, good night..... See ya'll tomorrow! I am a Bama fan, but have had more fun today chating it up with some classy UGA fans than @ alot of our own sites. Will be back tomorrow to continue if ya'll will have me. Is it 7:45 Saturday yet? To me, this is not a case of schadenfreude. All I care about is winning Saturday - and even then, will not revel about other's loses. Except of course, should Ole Miss beat FL. I don't "revel in others' losses", but I always love an underdog (especially an unranked team) beating a higher-ranked team...unless it's Georgia on the losing end. It's also nice to see ESPN's poster team lose to a 1-win team, after blowing out ESPN's former poster team. Let me tell you guys about the '98 TN game. I had been to the LSU night game and saw QC dazzle the Tigers with an end-around pass and catch for a big first down. The hostile LSU fans were absolute hideous before the game and worse afterwards, if that's possible. With 1997 still fresh in our minds, the hype prior to TN was immense - this was OUR year. Then, Jamal goes down on Monday and the front page AJC sports section listed this news the following morning. I recall feeling very confident after seeing that - this was OUR year. We organized a huge bus trip to Athens - tailgating at the SunTrust bank next to the H Inn. Beautiful day, huge party, 1000's of hot chicks, perfect football day. We walk to the game and took our seats among many die-hard Dawgs and a few Vols. I noticed the Gameday crew on the bridge and was very proud to be a Dawg. This was OUR year. We had NO answer for the offensive or defensive lines. Our center was completely and utterly dominated by the VOL noseguard and QC spent the entire day running around and getting hammered. Yes PWD - the score did not indicate just how bad we were dominated. I could only imagine them having Lewis - it could have been 44-3. The last thing I remember, before blacking out, was those same Vol fans counting to 8, very slowly, with a few minutes left. Over and over and over. I hate those MFer's. TN went on to claim the NC and we finished 3rd in the east, as usual, b/h the usual suspects. The hype for this game surpasses the '98 game. Let's take care of business this time. i was also at that 98 game in baton rouge. the lsu fans were very cordial to my group. i love the tailgate atmosphere there. Yes Brandon, I think ugag proved tonight that it is, in fact, the overrated turd in the punch bowl. Maybe, just maybe, stafford picked up enough garbage points to get AP voters who didn't watch the game to keep you guys in the top 20. Then again, that first half was the most embarrassing half of football I've ever seen. Hey Bulldogs. We just beat the hell out of you! We will meet again in Atlanta in December, and we will have our full team back (outside of 2 players) probably. Injuries didn't cost us that game last night, you guys whipped us straight up. However, with guys like Southerland, Ellerbee, Battle, Banks & others back, this will be a much stronger team. Enjoy your September win. I'll sure enjoy ours on Dec.6.